It’s five a.m. on a crisp spring morning in the densely populated hillside community of Immun-dong in Seoul. The sun is just sparking on the dew settling on lids of the huge brown onggi ceramic jars that nest all over patios and rooftops like odd eggs awaiting their mother’s warmth. Like most of their makers, even the kimch’i vegetables and bean paste sauces curing and pickling inside are still snoozing. The air is uncharacteristically quiet and blessedly clean for this otherwise manic metropolis. Kim Keumhwa, Korea’s renowned charismatic naramansin, “national” shaman, is already awake, dressed casually in slacks and a polo shirt who quietly moves about her small home’s second floor preparing to greet the spirits lodged in her small sindang (spirits’ shrine room) next to her bedroom. I am awake anticipating another very exciting day as a guest in her home and friend to her ritual partners. With a few silent gestures she invites me to help her remove the half dozen brass and ceramic bowls resting on the three-tiered altar that runs on three sides of the room and to replace the water therein. We rinse and refill them with water from a nearby sink and replace them on the shelves. She offers me a box of matches by which to light two large candles in the center, by which to light and offer incense in the large brass urn filled with clean ash. As my eyes adjust to the candlelight, sword-brandishing, mounted mustachioed warriors, flanked by esteemed high administrative officials and Judges of Heaven, Hell and Earth, venerable philosophers, scholars and kings, dragons, turtles, constellations of stars and tigers portrayed in colorful paintings and statues leer at us from the walls and shelves. They are nonetheless wide-awake from their night’s watch. I smile back sleepily. In a dozen full prostrations, we entreat her spiritual intimates to continue to uphold peace among themselves and us mortals. Downstairs, this tall, athletic-looking woman of almost 70 years tiptoes past rooms full of sleeping extended family members and her housekeeper. Sliding open the glass door to the front patio, she slips on sneakers picked from a dozen or more pairs of shoes. I follow her down the steep lane to the main street of a Seoul neighborhood that long ago lost its rambling rooflines of hanok, traditional Korean architecture, that were raised (or fallen due to the test of time). Now the area is filled with a sprawling modern apartment complex of huge, look-alike concrete structures that line up like a set of encyclopedia volumes, each sporting a number and name on its side. We walk along for one block past metal streetside roller doors that cover shop windows and doorways like closed eyelids and then begin to ascend back up another hill to the small forested woodland behind her home. Stopping by a small residence, “Ajumoni”, a friend of hers, joins us and together we continue to our first destination, a small community center playground, for a three-quarter hour set of aerobic, gymnastic and tai-chi exercises. Keeping up with this extraordinary woman, recognized by the government as the lineage carrier of Korea’s Important Intangible Cultural Asset #82 — the Beyonshingut and Daedonggut, West Sea Fishing Ritual — is not easy for me, almost two decades her junior! The heart-pounding routine is only the beginning. We bid good morning to her friend and proceed at a spirited clip up paved and dirt paths past Kyung Hee University’s Neogothic-style buildings and finally arrive at a small clearing deep the woods. We take a brief rest at the reputed site of a venerable philosopher’s tomb. As the sky becomes lighter we see other early-morning fitness enthusiasts who are undergoing their own regimens of energetic twists and stretches, happily chatting and encouraging each other. She greets some friends and explains that I am a guest from the USA. Finally at the top of the mountain, we sit on granite boulders shaded by pines and maples to take in the vista of one of the world’s most burgeoning metropolises. By now the sun is fully up, clearly illuminating brick bathhouse steam spouts and metal church steeples with their names in square white block Hangul, Korean letters. Huge cranes loom over the ever-present construction sites. We can hear Seoul waking up. With no time to waste, we head back home. This rigorous nearly three hour daily work-out keeps Kim Keumhwa’s constitution in shape for the strenuous hopping and whirling, chanting and praying that is characteristic of multi-day Korean shaman rituals. 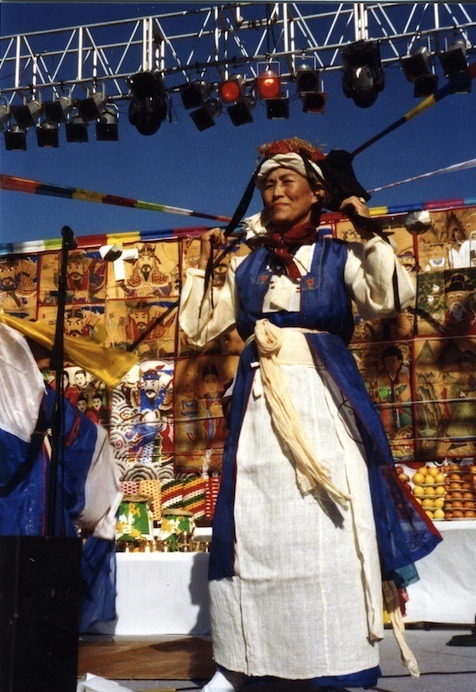 Many women (and a few men) in her troupe of more than 15 senior and apprentice shamans and master musicians (including two other nationally-renown ritual specialists) were war refugees like herself from the former northern Hwanghae-do province. 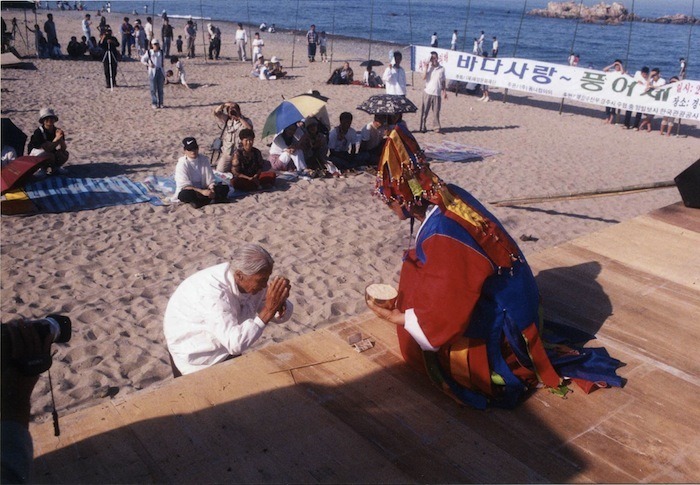 The group “performs” its rituals frequently throughout the country and abroad, whether commissioned to present pageantry of Korea’s indigenous religion at international arts festivals or to gather in private service to help deeply troubled individuals plagued by malevolent spirits. On many occasions they attend to the spirits’ needs at Keumhwa-dang, Kim Keumhwa’s cultural center on Kanghwa-do, an island in the West Sea near Incheon. She is also forever being taken by car or subway to meetings with government culture czars, businessmen, scholars and fellow artists to discuss upcoming festivals, the status of the traditional arts, the pressing issues of reunification and the preservation of the natural environment. The author of several autobiographical books and the 2013 documentary biogpic Manshin: 10,000 Spirits, Kim Keumhwa is the first Korean shaman to discuss the rituals from the perspective of a practitioner. Her huge memorized repertoire of liturgical chants, instrumental music and ritual staging not only enables her to perform rituals with unparalleled precision, but also to teach the long operatic libretto and scenarios to her apprentices with the benefit of written notes. And she participates in all pre-ritual preparations with her apprentices and assistants, from preparing the food for the offerings to creating and cleaning the ritual implements. She is a demanding teacher … actually, the spirits are demanding! On an average day when she’s at home, a steady stream of clients consult with her on all matters of life begin to arrive about 8:30 am. They arrive by appointment, made with the assistance of one of her initiates, and await in her living room as the family goes about its’ daily routine: grandsons getting ready for school, daughter-in-law preparing to go to Incheon to deal with the business matters of the Society for the Preservation of West Sea Baeyonsin-gut and Daedong-gut, the name of Kim Keumhwa’s group, one of the coastal city’s signature unique cultural art forms. In turn, one by one, or in family or collegial groups, they are welcomed upstairs to enter the sindang where she will perform a variety of rituals, whether at her small divination table, lighting candles for their deceased loved ones, seeking special favors of the spirits to repair a distressed marriage or find a new one, to ask for the restoration of health of the body or business. But today will be different; we cut our exercise routine short and hurried back to her home. The a large troupe of 22 members, including several retired fishermen who support her as roadies and as a choral/instrumental ensemble, were arriving at her home at 6am. Together they busily pack up cases of food offerings for the spirits, a small arsenal of swords and other traditional weapons, suitcases full of brightly colored costumes, musical instruments and other essential ritual paraphernalia and loaded them into the society’s two vans and a few private cars. The troupe has been commissioned to join two other nationally renowned shaman groups at a two-day Sea Festival in Gyeongju on the eastern seacoast. 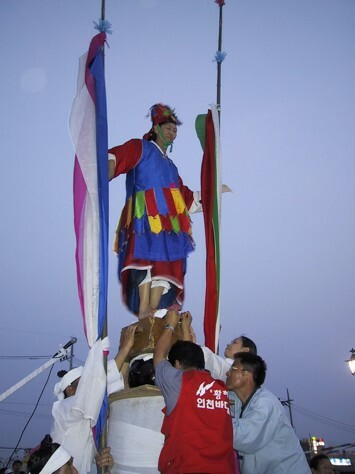 Mansinnim’s group will perform their unique daedong-gut ritual, a village ritual for harmony and reconciliation. After bouncing around for six hours crammed into the vans (with requisite breaks for smokes, snacks and toilet at auto plazas on the highway) we arrive at our accommodations at Taebon Beach. Our accommodations were a ramshackle hanok with several rooms (empty of furniture but full of bedding) connected to a common open wooden porch and courtyard. The resort town appreciated for its historic site — the offshore underwater tomb of Shilla King Mumu — and its sandy beaches, boat rides and fresh fish restaurants. Dinner is a seafood feast in one of them, and we retire early from our ordeal on the road. The festival will begin tomorrow and there is a lot of preparation needed for the ritual. In the morning, Kim Keumhwa substitutes our sunrise city workout with a quiet walk to the surf to greet Yongwang, the Dragon King of the sea, for whom she has a deep fondness. At the water’s edge she utters her prayers facing the rising sun, her palms together at her heart, and she bows. Our physical energy is invested in picking up candles, candy wrappers, cigarette buts, empty soju bottles and other trash carelessly discarded on the beach by late night revelers. I am very moved by her focused attention to this menial task, certainly one which would not be expected of a person of her status, but which reflects her deep reverence for nature. She points to places where the remnants of melted candlewax attached to ribbon of five colors stuck in the sand. “Shamanism”, she utters. The plan for the festival was that each of the three shaman groups would begin their rituals on the first day and finish them on the second day. At the lodging, the assistant and apprentice shamans began to prepare rice cakes by steaming the ssal, raw rice, and dried red beans in aluminum pots on portable table top butane stoves; other stoves were used to fry tofu and vegetables. At the festival site, a hastily constructed stage with a long altar along the back wall, others were busy by carefully piling brilliantly colored sugar “candies” into towers of compelling patterns. (Ancestor spirits love sweets!) Cases of apples, bananas, melons, Asian pears, clusters of huge concord grapes and other fruit were opened and their contents wiped and also piled high into towers with plastic plates in between rows to stabilize them. The brass bowls and candlesticks, gongs and swords that had been polished in Seoul were set out and dozens of colorful hanbok, traditional Korean clothing, were unpacked from suitcases. The backboard was festooned with a large array of brightly painted taenghwa, spirit icons brightly rendered in paint on cardboard, placed tightly next to each other. Many of these icons have been used in Kim Keumhwa’s rituals for decades. Everyone knew his or her task and undertook it with quiet joy, intention and cooperation. As a gesture of respect for the situation and as a guest, I did not impose my desire to be of use. The audience crowd was very sparse when the ritual began in the afternoon, making it seem that the shamans were entertaining more the underwater sea life than humans, but all was undertaken with professionalism that befits groups of these master ritual artists. The day was beautiful, with blue sky and a light summer breeze. During breaks the members of the group were upbeat; we laughed, they would sing what seemed to be folk songs, smoke cigarettes and enjoy the fresh air. Each group presented the first half of their respective rituals in turn. At the end of the program, we packed up everything except the stage. While beachgoers were rolling up their mats for the day, we ate dinner and retired early. On the morning of the second day of the festival, the troupe learned after breakfast that the promoter who arranged the festival would not honor his contract; they will be paid only a third of the promised fee. I was told he makes an excuse that the sponsorships were short of what was budgeted. Furthermore, the restaurant owner where we ate our meals came asking for payment from the group, but the costs were to have been born by the promoter. The situation is falling apart. The heads of the other shaman groups arrived at our lodging, and a meeting among three of the top shamans in Korea– all recognized as master ritual artists of Important Intangible Cultural Treasures — to discuss the difficult matter at hand. They all have had the same problem with the promoter. Meanwhile, members of her troupe prepare food offerings and entertain themselves with jokes, hearty joyful singing and abiding patience. Occasionally snacks are brought in, and through the crack in the doorway, one can see and hear the meeting conversation continue with alternating periods of intense audible conversation and deep silence for over three hours. Finally, Kim Keumhwa decides they all must uphold their commitments to complete the remainder of the program as scheduled and will perform the final rituals in the afternoon as planned. After extensive negotiations, the other two agree. Mansinnim then decides to take a nap and invites me to do the same. Knowing what lies ahead for her personally in the ritual, I wonder how rested she can become after such reversal of fortune and what her dreams will be. The second “half” of the ritual proceeds as planned in the afternoon, one scene scripted to follow another according to the integrity of the program and the spirits’ will. At the beginning of the ritual, as would the officials of a town or business that has commissioned such a ritual, the promoter is invited to come up to the stage to make the formal offering before the altar. His hubris is showing through gleaming eyes, and he enjoys his moment under the bright sunlight. As he makes a much too theatrical bow, officiant of this part of the ritual, clearly “inspired” by the spirit of the ancestor of all maligned shamans, deftly trips the promoter to his knees, forcing him into a more humble position! Yes, the spirits have many ways to teach humans how to get along. The ritual continued for about two hours; different shamans donned appropriate costumes to enact the scenes for the appearance of unique spirits. 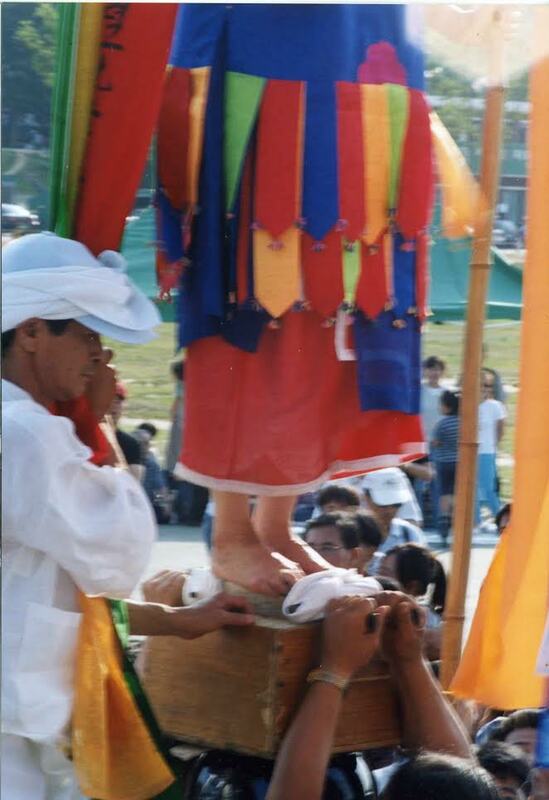 Some were very comical and others deadly serious, each ritual artist dancing and chanting as the spirit literally moves her in a clearly improvisational manner of the charismatic, northern Korea shamanic tradition. Members of the public were welcomed to come up to the altar and make personal offerings of money; about $10 was the norm. 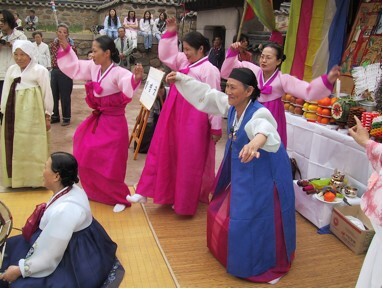 Most were older women who have made up the bulk of adherents to Korea’s indigenous traditions for generations. Their eyes were sparkling as they interacted with the shamans. Next, a huge, slaughtered but unbutchered boiled pig, was brought up to the stage; its’ legs spread fore and aft, eyes wide open, ears perked upwards as if it were taking a huge leap into the beyond. Eventually one of the shamans thrust a heavy handled trident into its slit belly and raised it up on the handle’s end to balance atop a bag of uncooked rice. Mokkoli, unfiltered rice wine was poured onto it from a ladle with bold gestures, and 10,000 won bills were stuck to the liquid on the still cold pink skin; others bills stuck into its ears, mouth and snout. When the pig finally balanced like a merry-go-round animal from a pole, it was declared that the spirits were appeased, and this part of the ritual was considered accomplished successfully. At once the instrumental music (cymbals, changgo, hourglass drum, double reed horns and various gongs) came to a frenzied crescendo and overtaking the sound of the swelling surf off-shore. The chaktu-kori will begin. 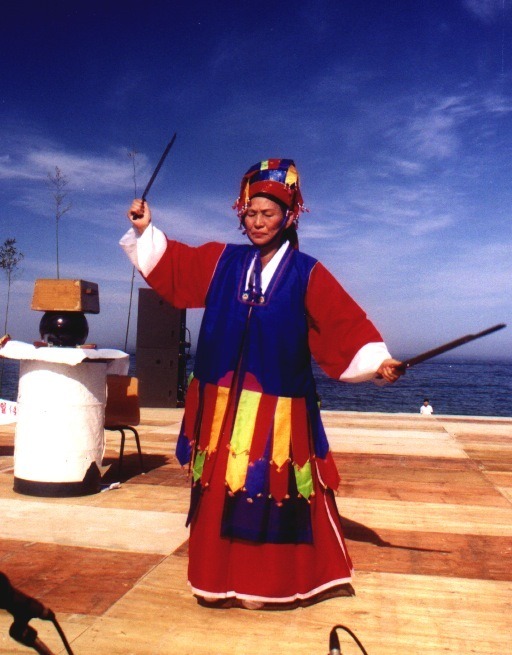 Dressed in the five-colored streamer-decorated costume of the Knife-Riding General, Kim Keumhwa whirls in the traditional circular pattern of her shaman ancestors and points dagger-like short brass swords at her breast, arching into a deep back-bend. She then picks up the pair of chaktu, two-foot long, razor-sharp iron rice straw cleavers, each weighing over five pounds, and begins to swing each one at her bare arms and legs. They are so sharp that they almost attract skin to their edge! She presses the edges into her cheeks and tongue. No blood is shed. Giving her assistants the blades, she dances with the spirit to the edge of the stage and accepts tribute from the by now over 100 people assembled on the sand. She is renown for this unique ritual element. Turning with explosive physicality, she takes a running barefoot leap up a small ladder next to toward a seven foot tower assembled by standing two oil drums atop each other, and then adding a large crock filled with water, upon which sits a wooden box filled with uncooked rice and, finally, the upturned chaktu, now bolted together in parallel about six inches apart like railroad track. Holding onto fifteen-foot bamboo poles festooned with five-color streamers placed on either side for balance, she mounts the blades, turns first to bow to the altar and then to the audience. Her strong, clear voice is at once singing, praying and offering the spirit’s oracles for hope and good fortune of the assembled. Staring off into the distance, she is ecstatic and invincible – and I’m exhausted just from watching. There is no question in my mind that I don’t need to believe in what I am seeing, any more than I believe that King Mumu is under that rock out there beyond the surf. I saw the assistant sharpening the blades that morning. I saw her spend three hours discussing the sad state of affairs for shamanism and greedy promoters. They all had spent a lot of time and energy to prepare a ritual full of integrity for a very small number of people. What more can one do? POSTSCRIPT: Two days later, on Veterans Day, Kim Keumhwa again performed the chaktu-kori at a major rally she herself had convened on the banks of Seoul’s Han River, in support of reunification and to promote environmental sustainability. One week later, the “other” two Kims, presidents of this divided land, pledged to work toward just that. She continues to keep trying to this day.